Heathkit GR-54 General Coverage Communications Receiver.. « Adafruit Industries – Makers, hackers, artists, designers and engineers! Heathkit GR-54 General Coverage Communications Receiver..
Radio Archeology: Heathkit GR-54 General Coverage Communications Receiver. Whenever I want to play with a new radio I look around the basement and see what’s down there. With myrecent acquisition of the Heathkit BR-2 Broadcast Receiver I wondered what else I had in the way of Heathkit receiver kits. There is was – my Heathkit GR-54 General Coverage Communications Receiver. The GR-54 was produced between 1966 and 1971. It is all mode (AM/LSB/USB) single conversion Superheterodyne consisting of 6 tubes (6BH6 RF Amp, 6EA8 Osc Mixer, 6BA6 IF Amp, 6BA6 IF Amp, 12AT7 BFO Product Detector, 6HF8 AF Amp and diodes). The price when this kit was produced was $85-$135. I got a real deal on this one. I paid $25 for it in good working condition. And that included the manual. When I was 15 yrs old, I was offered a Summer job at my local grade school cleaning toilets, mopping/waxing floors, and weeding the gardens around the school and church for $1.50 and hour. Being obsessed with electronics, the first thing that I bought with my very hard earned money was a GR-54… It was one of the most precious items of my life for many years… all the things I learned with it, and because of it. 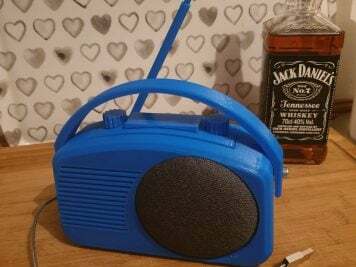 That radio solidified my obsession with electronics, and lead me to the very lucrative profession as a very well employed electronics design engineer today. Like so many electronic engineers of my age (mid 50′s), I owe my start to hard personal work, and Heathkit. Through the years, I collected manuals and studied the theory sections until I understood how the item worked. I specifically recall sitting in the lunchroom of Denby High school studying the IB-100 frequency counter- amazed that it indicated the measurement in “numbers” and not an analog meter. I sat there trying to understand the description of a “flip-flop” while my classmates were throwing food at each other (wonder what they are doing today?) I studied, studied, and studied until I finally understood how each stage functioned for every manual that I could afford those days (at $2.00 each). We hope every kid now has a favorite kit they’ll look back on years from now. I built many Heathkits for myself, family, and work. For myself, I mostly built test equipment; power supplies, scope, signal generators, and a transistor tester. For family members, I built color TV, audio equipment, and general coverage receiver. For work, I built power supplies and RLC bridge. I learned a good bit from the manuals. I learned A LOT when I got the ‘scope. I also learned from all the popular electronics magazines and built kits from SWTPC and Lafayette Radio. Recently I have built kits from CanaKKit. I’ve also learned a lot from application notes, and data sheets. While that was one Heathkit I never had the pleasure to own, it would have provided the same exquisite pleasure that my ancient Hammerlund HQ-160. The experience of surfing the air would not be complete without the subtle aroma of toasting dust on the numerous vacuum tubes. In fact, it was such an integral part of my experience as a teenage Ham operator that I can scarcely imagine hearing the melodic beedle of RTTY, the angry rasp of radiofax, or the monotonous tick of Canadian time-standard CHU tranmissions in it’s absence.